Cognitive scientists, such as Keith Stanovich, distinguish two basic forms of rationality: 1) epistemic rationality, making our beliefs correspond with the actual structure of the world, and 2) instrumental rationality, behaving in such a way that you achieve what you want. Instrumental rationality is about doing what works and epistemic rationality is about finding truth. My view is that it is dangerous to overlook any of these two types of rationality. Only focusing on what is true but forgetting to do what works may lead to neglecting to do things that help you to survive and remain connected to other people. In extreme cases this may lead to a situation in which your questioning dominant false beliefs may threaten governing institutions so much that they may want to isolate you or worse (for example Copernicus and Socrates). Only focusing on doing what works but neglecting the 'what is true' question may lead to you moving efficiently through a web of falsity distancing you more and more from reality. In extreme cases it may lead to such pragmatism that individuals may gradually go along with and adapt to situations which systematically undermine human thriving of themselves or others. Relativism: In the second half of the twentieth century, a relativist stance has gradually become more popular. This stance calls into doubt the knowability of objective truth, or, in a more radical form, the very existence of objective truth. The relativist perspective argues that what is true is unknowable because any kind of knowledge is constructed in one's own mind through interactions with other people. Therefore, any kind of knowing can only be subjective or inter-subjective at most. Different people experiencing things differently, according to the relativist stance, have different ways of knowing or different "truths". Relativists argue that any view of reality is true in and for itself. Knowledge would thus always be local at best, never universal. This argument would imply that different cultures have different truths and that we should let go of the idea that objective truth statements are possible and also of the belief that "real" understanding of other people is possible. Another implication of (radical) relativism is that it is useless to think in terms of epistemic rationality and that we should focus only on instrumental rationality. Radical relativists are skeptical about science, viewing scientific claims as just another type of narrative and viewing the scientific process in purely instrumental terms (as means to achieve some end, other than discovering objective truths). Truth versus truth claims: I find the rejection of the idea that we can learn about objective truth and reality unconvincing. I agree with Alan Sokal (2008) who says that the relativist stance systematically confuses truth with claims of truth. Take the example of the shape of the earth. Once, people thought the earth was flat and they turned out to be wrong. Later, they thought it was spherical which turned out to be wrong too (it only approximates a sphere). Can we conclude from this that whatever we think will always be overturned later and that therefore truth really does not exist? No. The claim that the earth is flat is much more wrong than the claim that it is a sphere. The statement that the earth is a sphere can be empirically tested. Anyone who steps into a plane to fly to the other side of the earth implicitly acknowledges that the spherical view of the shape of the earth is more valid than the flat earth view. If we say that all claims are equivalent, there would be no measure of progress anymore, there would be no need for evidence and science anymore, and the whole notion of education would collapse. To deny that one claim could be further from the truth than another would be to say that anything goes. The notion of truth is useful but we should not think about truth in dichotomous terms but in continuous terms. I agree with Isaac Asimov in that we can distinguish between truth claims which are more or less true or false. While we indeed may never be able to formulate definite descriptions of reality/truth, we can distinguish between false and falser. Therefore, we can make progress in finding out what is true and what not. 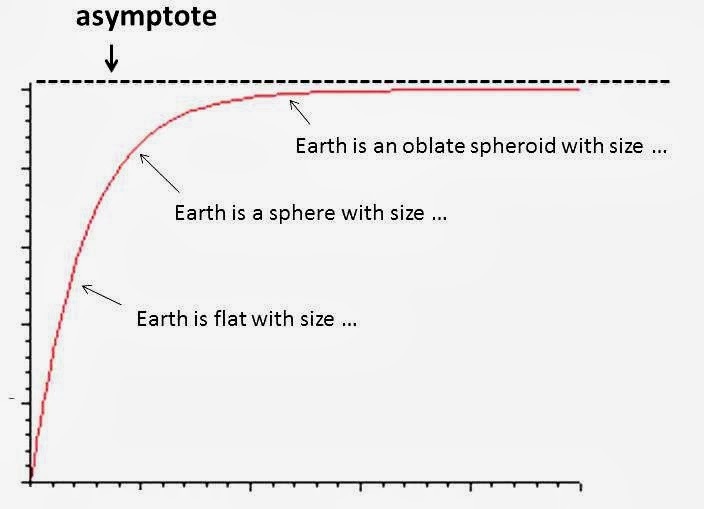 Objective truth as an asymptote: A helpful way to think about scientific progress is to view it as approaching an asymptote. In analytic geometry, an asymptote of a curve is a line such that the distance between the curve and the line approaches zero as they tend to infinity. 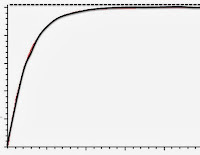 In the figure below the dotted line is the asymptote. 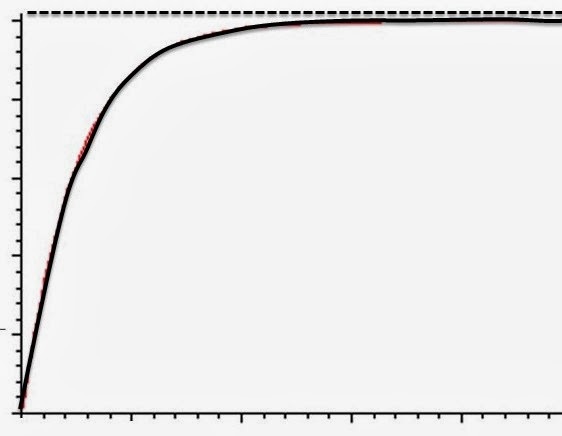 As you see, the curve is approaching the asymptote closer and closer. This is an interesting metaphor for how knowledge may develop. 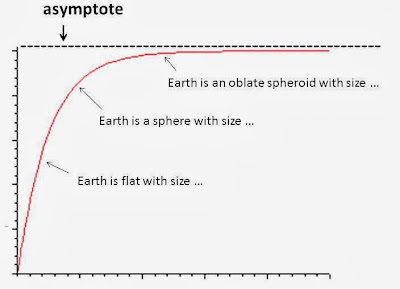 The asymptote reflects the true state of nature, reality as it is, independent of our interpretation of it. So what? This view is relevant for science in the sense that it is the basis for viewing science as valuable and as capable of making progress (see my article Improving Science). But it is also relevant outside science. In everyday life, we are bombarded every day with truth claims, from websites, from our friends and relatives, from journalists, from commercial parties, from professional authorities, and from religious leaders. Not being able to distinguish between false and (more) accurate truth claims makes us vulnerable to manipulation. In mild cases this may lead to waste; in more serious cases this may lead to great harm. As Voltaire said: "Those who can make you believe absurdities can make you commit atrocities." Dealing effectively with the bombardment of truth claims which confronts us every day starts with the notion that these truth claims differ in their validity. Once we know this, we can learn to distinguish false truth claims from more truthful truth claims. How to identify false claims: The more truthful a truth claim can be considered to be, the more it meets three requirements: 1) sound reasoning, 2) clear definitions, 3) availability of evidence. A good reason to distrust a truth claim is when it is based on defective reasoning. Examples of this are truth claims which are crucially based on a circular argument or which are self-contradictory. Another good reason to distrust a truth claim is when it is unclearly defined. One example of this is when vague and complex words are used which are unrelated to the relevant scientific knowledge base. Another example is a claim which is so broad that it is impossible to disprove. A final good reason for distrusting truth claims is when there is lack of supportive evidence and availability of counter-evidence. which contain evaluation-disabling properties, for instance by claiming that evidence is not relevant or even not possible, by denying that evidence exists, by making belief which is unsupported by evidence into a virtue, by encouraging adherents to attack non-believers, etc). The power of questions: In discussing these matters with other people I think it is often not wise to use a confrontational style. When people's most cherished (false) beliefs are threatened they are likely to become defensive and may even come out as stronger believers (this is called the backfire effect). The best way to help people improve their claim evaluation skills is to be respectful of them and ask them questions while being honest about your own perspective. These questions may inspire them to start evaluating their beliefs without becoming defensive. Having a degree in philosophy and finding myself working with companies & managers who tend to have have a belief vs evidence gap, I find the use of Truth and Truth Claims to be useful. One area of Solution-Focused that I still struggle with is 'The future is both created and negotiable' de Shazer More Than Miracles. This has felt to be a relativistic claim that feels, to me, to reject that evidence and reality exists that people may be ignoring and can be useful. I think that is an interesting question. I have thought about these issues too. This quote shows that Steve de Shazer and his colleagues were influenced by social constructionism. Some other quotes by de Shazer which show this are: "Theories are at best useless" and "There is no such thing as understanding, there is only more or less useful ways of misunderstanding." I disagree with these statements and think that the social constructionist/relativist perspective is not necessary for working solution-focused (as my post shows). For example, I view our capability of understanding the same as I view our ability to approach truth/reality. So, while completely understanding other people is likely to be impossible indeed, a useful distinction can be made between better or worse understanding. If anything, I think that social constructionist influence in solution-focused work has done more harm than good (for example in that it has led to a reluctance toward research and evidence). What I think about the future is that it is open in the sense that from a certain moment on countless scenario’s may unfold. What happens to us is, at least to a certain extend, influenced by what we do. So, in that sense we might say we have a creative, or co-creative, role to play. And this is, of course, extremely important. If it were not the case, why would we bother to make any choices? But to say that “the future is created and negotiable” also overstates our influence, I think. Many other factors outside our control influence what will happen. For instance, no matter how we negotiate, we may suddenly die when a tsunami hits the place where we live. So, we might also say “the future evolves” or “the future emerges”. Thank you Coert for a wonderful post. Viewing truth/false claims as positioned on a continuum, instead of in a dichotomy, seems a much more helpful approach indeed. Hi Tess, thank you. Nice to see you back here. Regarding your question about jokes, something like like these perhaps? Thank you Coert - it's great to *be* back! How long has it been?! I am reminded of the "call centre agent-" dialogue you featured here years ago, every time we receive a cold phonecall. Always - still - a nuisance. Lately, we haven't had any - thankfully (knock on wood). I found a great way to turn such conversations around though - this one only works for certain companies, but leaves me feeling affirmed every time. Also, now that I think about it, there is a foolproof way to be completely left alone. Is that thread still active? But moving back to the topic: it's magnificent to see the work you have been doing here. I have been missing out! All the more joy in catching up now, though. Very helpfull stuff all around. And yes, that includes the jokes! How about collecting those, and maybe some more in a dedicated Pinterest board? Such as http://www.pinterest.com/spllfndr/phun-to-progress-us/?